It does us good to read missionary biographies. This is especially true when those missionaries served during the great age of missions in the 1700’s and 1800’s. This was a period when missionaries traveled overseas into uncharted and unfamiliar lands. As they left familiar shores they knew they might never return to their homelands, that they would inevitably suffer in terrible ways, that they would very likely give up their lives in service to the Lord. And still they went. 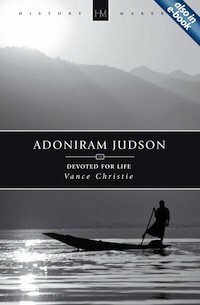 Adoniram Judson is the subject of an excellent new biography from Vance Christie, who has previously written works on Hudson Taylor, David Brainerd, and John and Betty Stam. Judson was the very first foreign missionary commissioned in the United States; he proved to be one of the greatest. In 1812 he set sail from America and arrived the next year in Burma (modern day Myanmar). He would serve in Burma for almost four decades and in all that time return to America only once and only briefly. His great passions were to preach the gospel and to provide a Bible in the language of the Burmese people. Though it would take him six years to see his convert, by the time he died there were thousands professing Christ. It would take him many more years to produce a full translation of the Bible, but today that Bible is still in use and still a pillar within the Burmese Baptist churches. He would write tracts that were produced in the millions, Burmese dictionaries and grammars that continue to influence the language today. He would shape missions all throughout the world and inspire thousands of others to dedicate their lives to missionary work. Judson suffered immensely through it all, and at times his biography is almost too painful to read. He was married three times, seeing two of his wives succumb to illness on the mission field. His grief was at times nearly overwhelming. His third wife’s health was so shattered that she only barely outlived her husband, dying in great pain at only thirty-six years of age. His three marriages produced many children, at least six of whom died in infancy to the great sorrow of their parents. During a war between England and Burma he was imprisoned for 17 months and for much of this time he was kept in deplorable conditions, suffering all manner of brutality. Judson suffered intense pain in his final days, exclaiming “How few there are who die so hard.” And in the end his body not given a proper burial, but thrown overboard in the middle of the ocean without as much as a funeral service or a prayer. His life was marked by some highs, but also many great lows. He suffered greatly for the Lord and was willing to count it joy. Let me offer a few reasons you ought to consider reading about Judson’s life. Read it to see the high cost some have had to pay–and have been willing to pay–in order to advance the gospel. It is not that you and I do not make sacrifices in order to serve the Lord; but so much of what we consider hardships pale in comparison to what Judson had to offer before the Lord. And though he did not always live with full joy, he continued to serve and to trust in God. We gain important perspective on our lives by reading what he had to endure in his. Read it to see the power and centrality of the Bible in mission. Judson was driven to produce a Bible in the Burmese language knowing that access to the Scriptures was necessary in order to bring spiritual life to these people he loved. When that Bible was translated and printed it began to do its work. It does us good to see the power of the Bible! Read it to see how bad theology can creep in and derail even a great man for a time. In the midst of some of his darkest grief Judson began to read from the Roman Catholic mystics and for a time this poor theology badly hindered his ministry so that he retreated from people and stopped his Bible translation work. The Lord had to revive and reform him in order to call him back to mission. Read it to see the value of being devoted for life. This was Judson’s motto: Devoted for Life. He wanted all missionaries to commit not to a year in the field, not to ten years, but all of life. He modeled this well, essentially becoming Burmese in order to reach Burma. The success of his ministry is directly related to his lifelong dedication to it. Read it to grapple with the tension between ministry and family. At that time men held mission higher than marriage and family; Judson was unwilling to leave the mission field and this cost his life, the lives of his children, the lives of his wives. That was considered the price missionaries had to pay. While he genuinely loved his wives and children, he battled to rightly prioritize them. His lifelong devotion to mission seemed at times to do battle with his devotion to family. And there are many more reasons besides.